As the state battles three federal lawsuits over a botched attempt to clear its voter rolls of supposed noncitizens, Whitley has been fighting a quieter battle at the Texas Capitol: To win confirmation as Texas’ chief election official, and to keep his job for much longer, he needs to muster support from at least some Democratic members of the Texas Senate, which has the power to accept or reject his nomination. But with several Senate Democrats who have already declared their opposition — and with pressure mounting privately and publicly for the rest of the caucus to do the same — he’s made little public progress in what is usually an uncontroversial process for nominees. Republican Gov. Greg Abbott continues to back his nominee “100 percent,” a spokesman said, and Whitley doesn’t seem to have given up himself. As recently as last week, Whitley met with Democratic senators in an effort to secure their votes. And though Whitley and his deputies have held firm in the overall efforts to verify the citizenship status of of almost 100,000 Texans, he even issued something of an apology for the way his agency bungled its rollout of the controversial voter citizenship review, which was based on deeply flawed data and seemingly pulled in tens of thousands of registered voters for review because they were naturalized citizens. But on Thursday, Whitley suffered a series of losses. After the Nominations Committee punted on his appointment for the second time following a blistering confirmation hearing, some three dozen civil rights and advocacy groups rallied on the steps of the Texas Capitol to hold the line on his nomination. And Whitley gained a powerful new adversary: El Paso Democrat José Rodríguez, who chairs his party’s caucus in the Senate. That marks a fifth public no from a Senate Democrat, and most of the rest of the caucus is expected to land there as well. Whitley requires a two-thirds vote to win confirmation, meaning if the 12-member Senate Democratic caucus stands together, it can block his path. But Democrats in the upper chamber — who have a reputation for avoiding controversy more than their colleagues in the Texas House — would have to tread carefully. 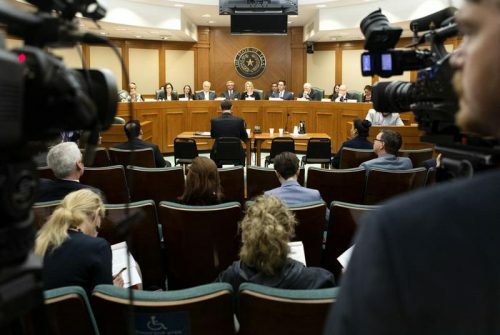 In a letter Thursday, some three dozen organizations — the state Democratic party among them — called on the Senate’s minority party to reject Abbott’s nominee and “affirmatively block” the confirmation of Whitley or any future nominee who declines to halt the review effort. If Whitley passes out of committee and his nomination is called for a floor vote, any absences from Senate Democrats could make it easier for the 19-member Republican majority to confirm his nomination. The confirmation requires two-thirds of senators who are present for the vote, so ill-timed absences could leave the minority party, and its narrow numbers advantage, vulnerable. The uncertainty over Whitley’s path to confirmation has played out amid three legal challenges to the review efforts he ordered over claims it unconstitutionally burdens naturalized citizens and discriminates against voters of color and those who are foreign-born. In court this week, state lawyers and a top Whitley deputy deflected those allegations by instead casting the blame for any foul-ups on county election officials. As Whitley has continued to take meetings with senators in hopes of garnering enough support to be confirmed, the Senate Nominations Committee’s inaction on his nomination doesn’t bode well for his chances. “Secretary Whitley deeply respects the Senate’s role in the nominations process and will continue to seek an open line of communication with Senators to address any questions or concerns,” Sam Taylor, a Whitley spokesman, said on Thursday. Meanwhile, Senate Republicans are expected to back Whitley’s nomination, but that may not be enough to push him through. State Sen. Paul Bettencourt, the Houston Republican who chairs the Senate’s GOP caucus and often whips votes for party priorities, said “the governor’s office is directly responsible” for shepherding the nomination through the Senate. “The Democratic Caucus has a lot to say on [the nomination],” Bettencourt said in an interview last week. Sen. Jane Nelson, the upper chamber’s veteran budget writer and another key GOP voice, told the Dallas Morning News this week that “I don’t know” if Whitley will be the next secretary of state. This entry was posted in KRTS News and tagged Secretary of State, Voting. Bookmark the permalink.